This is one of those recipes that I love to make because it’s cheap and sort of viciously American. Nothing says “American” like chicken, butter, and fat. This has all of the above. Take the wings and thighs out of the freezer and put about ten of them in a microwave safe casserole dish. Cover the dish with a plate. Set your microwave to run on “defrost” for about twenty minutes, turning the chicken every seven minutes or so. (Or check your microwave manual; my microwave took that long.) While it’s defrosting, measure out the flour and mix the chili powder and salt into the dry mix. Crack the eggs into a small bowl and whisk them with a fork. Once the chicken in the first casserole is defrosted, drain it. Put 1/4 cup butter and some hot sauce in a microwave safe bowl. Cover the bowl with a plate. Microwave it for thirty seconds to melt the butter. Set the toaster oven to 450 F to preheat. Then dip each individual piece of chicken in the egg and roll it in the flour/spice mixture. Arrange them in the casserole dish as you go. When the chicken pieces are all covered in flour, drizzle the butter and hot sauce on top. Bake the chicken pieces in the toaster oven for 45 minutes. 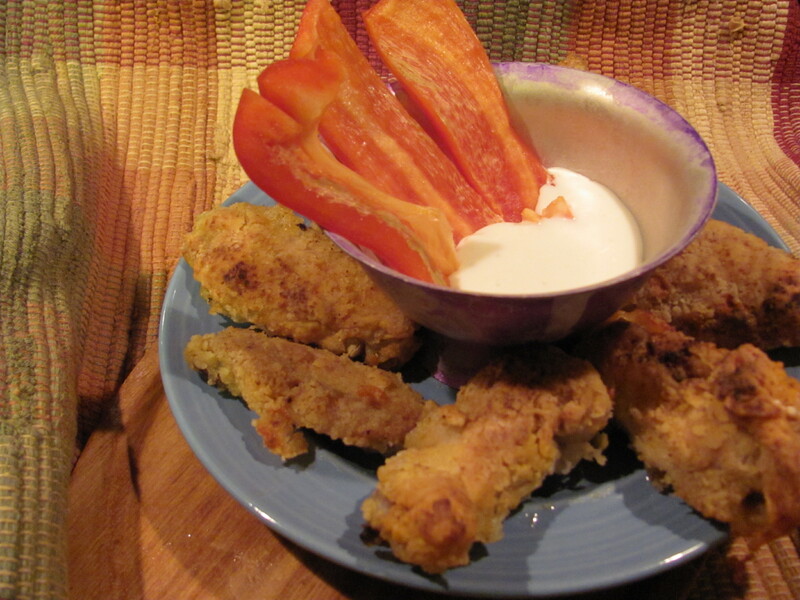 Serve with blue cheese or ranch dressing and red bell pepper strips or celery sticks. Cost: About $4.00 for two batches. Serves: I don’t know. How much of that you gonna eat? Note: Recipes like this are one of the reasons I would never attempt to include fat and calorie information. What joy to see my daughter is a genius at cooking and web site design…and it leads me to slipr to see what Christopher is doing!